Medicare enrollment and benefits can be confusing. If you are currently eligible for Medicare or are nearing the age of Medicare eligibility, it’s important to get a better understanding of how to navigate some of these vital enrollment dates. Keep reading for more information about this and other important Medicare enrollment periods. 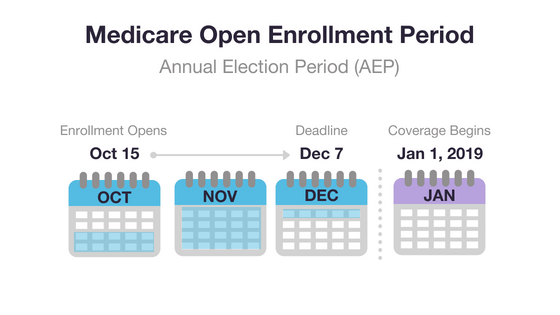 You should pay special attention to the Medicare Open Enrollment Period (OEP), which is also called the Medicare Annual Election Period (AEP). Medicare recipients can enroll in, make changes to or disenroll from a Medicare Advantage plan (Medicare Part C) or a Medicare Prescription Drug plan (Medicare Part D) during this period, which runs from October 15 to December 7 every year. Plan elections made during the 2018 Medicare Open Enrollment Period go into effect January 2019. You may be automatically enrolled for Medicare Part A and Part B benefits if you are age 65 and already receive Social Security or Railroad Retirement benefits. If you are under age 65, you may be automatically enrolled if you have received Social Security or Railroad Retirement disability benefits for 24 calendar months. If you are automatically enrolled, you will receive your red, white and blue Medicare benefits card in the mail. Your Medicare coverage will begin either on the first day of the month during which you turn 65 or on the first day of your 25th month receiving disability benefits. If you are under 65 and have amyotrophic lateral sclerosis (ALS/Lou Gehrig’s disease), your Medicare benefits will start the same month your disability benefits begin — there’s no 24-month waiting period. If you are approaching your 65th birthday, meet Medicare eligibility requirements and do not currently receive Social Security or Railroad Retirement board benefits — or if you are under 65 and eligible for Medicare because you have End-Stage Renal Disease (ESRD) — you need to manually enroll for Medicare benefits through The United States Social Security Administration. Veterans who receive VA coverage and are eligible for Medicare can also consider enrolling in Medicare Part A and Part B. If you have VA benefits as well as Medicare coverage, your options for care and your coverage net can be widened. Your qualified care would be covered under Medicare Part A and/or Part B, even if you go to a non-VA hospital or doctor. The earliest time you can enroll in Original Medicare is during your Medicare Initial Enrollment Period (IEP). Your Initial Enrollment period lasts for seven months and begins three months before you turn 65, includes your birth month, and extends for another three months. If you are under 65 and qualify for Medicare due to disability, the 7-month period is based around your 25th month of disability benefits. If you do not enroll in Medicare Part B during your Initial Enrollment Period but decide to enroll later in life, you will have to pay a late enrollment penalty. Your Part B monthly premium could go up 10 percent for each 12-month period that you were eligible for Part B but didn't sign up. You pay the Part B late enrollment penalty for the rest of your life as long as you remain enrolled in Part B. If you are interested in joining a Medicare Advantage plan or a Medicare Part D Prescription Drug plan, you typically can only do so during specific times of the year. The first time you may be able to enroll is during your Medicare Initial Enrollment Period. If you choose not to sign up for a Medicare Advantage plan or stand-alone Medicare prescription drug coverage during your Initial Enrollment Period, you can also enroll in a Medicare Advantage plan during the annual Fall Medicare Open Enrollment Period that lasts from October 15 to December 7 every year. You may also qualify for a special enrollment. Or call 1-800-557-6059 (TTY: 711) to speak with a licensed insurance agent. If you have Original Medicare and would like to enroll in a Medicare Supplement Insurance policy, the best time to sign up is during your six-month Medigap Open Enrollment Period. You must be enrolled in Medicare Part A and Part B in order to buy a Medigap plan. Your Medigap Open Enrollment Period starts as soon as you are age 65 or older and are enrolled in Medicare Part B. Insurance companies cannot deny you Medigap coverage or charge you a higher fee for pre-existing health conditions if you apply for Medicare Supplement Insurance during your Medigap Open Enrollment Period. If you don’t sign up for a Medigap plan during your Medigap Open Enrollment Period, you may still be able to buy one at any time. Insurance companies can take your health into consideration when setting your premiums or deciding whether or not to offer you coverage, however. 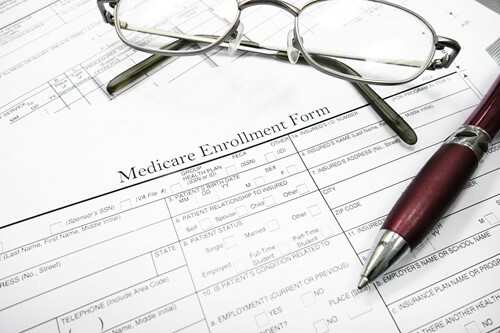 What Are the Benefits of Enrolling in a Medicare Advantage Plan? Also known as Medicare Part C, Medicare Advantage plans are sold by private insurance companies and serve as an alternative way to receive your Original Medicare (Part A and Part B) benefits. Medicare Advantage plans are required to provide at least the same benefits as Original Medicare, and many plans may offer additional benefits. The availability of Medicare Advantage plans in your area will vary and is subject to how many insurance companies offer plans where you live. There are five types of Medicare Advantage plans that are the most prevalent, and the availability of each type of plan will also vary based on your location. When comparing Medicare Advantage plans, it’s important to consider the type of plan you want, the benefits offered and the availability of plans where you live. The state of Alabama offers a wide variety of resources to its residents over 65 who are looking to purchase a Medicare plan. Alabama Department of Insurance – Here you can learn more about your health insurance options, including Medicare Advantage plans and prescription drug coverage. Alabama Agency on Aging – Through this website, you can find free, unbiased counseling regarding your Medicare benefits, coverage options and other Medicare questions you may have. Alabama Ageline – Through Ageline, Senior Rx provides financial assistance for seniors on a prescription drug plan, helping them get their medicine for free or at a low cost. Alaska does not offer Medicare Advantage plans (Part C), but there are still other options for you to explore your Medicare coverage options and have your questions answered. AARP Public Benefits Guide – AARP provides a comprehensive guide on how Medicare can help pay for your healthcare and prescription drug needs and how you can save with a Medicare Savings Program. Alaska DHSS- Senior and Disability Services – This site provides to a handful of helpful sites that deal with topics such as what you can expect when getting ready to enroll Medicare or Medicare Supplement Insurance plans and how to report fraud and abuse. Alaska Department of Retirement and Benefits – This site provides a detailed FAQ list that covers questions you may have about Medicare and other insurance options. Anchorage Senior Activity Center – Even if you don’t live in Anchorage, this site provides helpful information that will help you with the Medicare enrollment process. Learn more about your Medicare benefits as an Arizona senior. Your state provides a plethora of information to help you become more knowledgeable. Arizona Department of Economic Security – This government site provides information about Medicare Advantage plans that are available as part of a collaboration between Medicare and private insurance companies. SHIP – This service provided by the Arizona Department of Economic Security answers any questions you may have. AHCCCS – If you need help paying for your Medicare costs, the Arizona Health Care Cost Containment System may be able to help. Arizona Department of Insurance – This state department offers information on health care resources and long-term care resources for Arizona seniors. Arkansas provides plenty of options for you to learn more about Medicare and how to enroll. Public Benefits for Arkansas Seniors – Go directly to pages 6-11 to learn more about your Medicare options in Arkansas. Arkansas Consumer Assistance – Although Arkansas stopped participating in in the federal Consumer Assistance Program grant in 2014, the state still provides assistance to those who may need it. AR Medicaid – Learn how your Medicaid benefits can work with your Medicare coverage. California provides a number of resources to help its residents navigate Medicare, including assistance programs and disability options. California Department of Insurance (CDI) – This is the general CDI website that provides a wealth of information about Medicare and health insurance in general. California Department of Aging – This department provides programs to help seniors and those with disabilities. For assistance in your county, contact your local Health Insurance Counseling and Advocacy Program (HICAP) office. California Health Advocates – Medi-Cal and other support programs provide help with paying for certain Medicare costs. 250% California Working Disabled (CWD) program – To qualify, you must be working, disabled, and not qualify for Medi-Cal. Colorado provides several resources to help residents navigate Medicare. Colorado Department of Regulatory Agencies — Find SHIP counselors, Medicare basics, and prescription drug benefit information. Low Income Assistance Program — The Extra Help/Low Income Subsidy can help pay your Medicare Part D premiums, deductibles and copays. Old Age Pension Health and Medical Care Program (OAP) — If you make too much money to qualify for Health First Colorado and receive Old Age Pension, you may be eligible for the OAP Health and Medicare Care Program. Prescription Drug Discount Resources — This site offers a wide range of information regarding discount prescription drugs and participating pharmacies. Use the websites below to learn more about Medicare and other resources available in Connecticut. Choices Program – Also known as the CT SHIP, this organization provides help and counseling to seniors about health insurance, including Medicare. State of Connecticut Insurance Department – Use this site to research any of your pressing health insurance questions. Medicare Savings Programs - Connecticut regulations regarding eligibility based on income and assets differ from the federal guidelines. State Department on Aging – Learn about the different programs serving older adults and aging and disability resource centers. Delaware offers several Medicare Assistance programs and a State Health Insurance Program that offers counseling and other services to Medicare recipients. The following sites provide more information about Medicare and other resources. Delaware Medicare Assistance Bureau (DMAB) — Formerly known as ELDERinfo, DMAB provides free health insurance counseling for Medicare recipients (including those who are under 65 years of age). National Council on Aging — The NCOA provides state-specific guidelines for Medicare Savings programs. Delaware Division of Services for Aging and Adults With Physical Disabilities – This division of Delaware Health and Social Services provides information for caregivers, seniors and other Delaware residents, including information on how to report Medicare fraud in the state. Washington D.C. offers a few resources to Medicare recipients in the district, and there are a few options that seniors can explore for more information about their options. DC Medicaid – Qualifying residents of the District of Columbia can receive help paying for medical services from doctors, hospitals and pharmacies who are enrolled in the program. Health Insurance Counseling – George Washington Law School’s Health Insurance Counseling Project is a free resource for Medicare beneficiaries who live in Washington, D.C. Their counselors can help with a number of Medicare questions and issues. Senior Service Network – Find out more about community-based agencies that help seniors in a number of ways, including through in-home relief and transportation services. Florida provides Medicare Savings Programs and other assistance to Medicare beneficiaries. Consult the following resources to learn more. SHINE (Florida SHIP) – The SHIP resource center includes lots of general Medicare information as well as state-specific information. Financial Assistance for Medicare Beneficiaries – FAMB offers information about Florida Medicare Savings Programs (MSPs) and Extra Help/Low-Income Subsidy programs. Extra Help with Prescription Drug Costs – Find out if you qualify for out-of-pocket savings on prescription drugs. Georgia offers Medicare Savings Programs and free health insurance counseling to residents of the Peach State. Click on the links below to learn more. GeorgiaCares (Georgia SHIP) – This site includes general Medicare information, Medicare counseling, outreach and education, and additional services. Financial Assistance Programs (LIS, MSP, and PAP) – Learn about three different assistance programs that can help you pay for Medicare out-of-pocket expenses and prescription drugs. Georgia Prescription Assistance Program – This program helps Georgia residents save money on prescriptions at more than 60,000 pharmacies in the state. Just as you would in the states on the U.S. mainland, you may qualify for Medicare assistance programs if you live in Hawaii. Check out these helpful links to learn more. Hawaii SHIP – Find local help if you live in the Aloha State and receive Medicare benefits. AARP Guide to Public Benefits in Hawaii – This site includes information on eligibility and how to apply for Medicare Savings Programs. Hawaii Rx Card – Learn more about Hawaii’s prescription drug discount program that’s available to qualifying Hawaii residents. ADRC Hawaii — Find information and local resources for people with disabilities and for families, caregivers and other people who help people with disabilities. This includes people under age 65 who are disabled or who have ESRD. The resources below can help you navigate Medicare benefits in Idaho. Department of Insurance – This department can help you if you have any questions about a Medicare plan you have already enrolled in. Idaho Department of Health and Welfare – If you have concerns that you cannot afford health insurance, you may be eligible for Medicaid benefits. Senior Health Insurance Benefits Advisors – If you have a disability, end-stage renal disease, or just a general question about Medicare eligibility, contact these folks. This site also explains coverage choices and the different parts of Medicare available to Idaho seniors. Idaho Commission on Aging – Learn how to detect and avoid Medicare fraud in order to help prevent abuse. U.S. News Health – This report includes detailed information about Medicare Advantage plans in Idaho. Illinois offers a number of helpful resources that Medicare recipients will find useful. You can find Medicare Savings Programs to help you pay for Medicare out-of-pocket costs. Learn more below. Illinois SHIP – Explore up-to-date Medicare information that’s pertinent to Illinoisans. Medicare Cost Sharing Expenses – Learn how Medicaid can help with Medicare cost sharing. Illinois Cares RX – Illinois’ prescription drug assistance program was discontinued in 2012 due to budget restrictions. The Illinois Drug Card and the Illinois Rx Card are two options, however, that some seniors may be able to use to get discounts on their prescription medications. The Hoosier State provides many resources for seniors who are looking to learn more about Medicare. Read below for more detailed health insurance information and other resources. Indiana DOI – The state’s Department of Insurance can answer any questions you may have about Medicare — what it is, if you’re eligible, when you can enroll and what the benefits are. SHIP – This state health insurance program provides you with free, unbiased information about your health care options in Indiana. Hoosier Healthwise – Medicaid services may be able to help cover some Medicare costs. U.S. News Health – This report outlines the different Medicare Advantage plans that are available to you based on your zip code. Hoosier Rx – This pharmaceutical assistance program can help you with your part D premium payments if you are older than 65 and make less than $18,330 a year. Iowa offers a number of resources on what Medicare covers, how you may be able to get help in paying your premiums and how to find other local resources. Medicare Savings Program – This program covers seniors who receive both Part A and Part B benefits. Iowa Department of Administrative Services – Even after you have enrolled in Medicare, retirees can continue their health insurance coverage with the state of Iowa. Iowa + Medicare – This site aggregates Medicare, Medicaid and health news and information for Iowa seniors. Kansas offers free counseling for those who are looking for answers to their Medicare questions. Read on to find out more and to learn about additional resources. SHICK – Senior Health Insurance Counseling for Kansas provides seniors in the state with free information and advice to any questions they may have on Medicare. KanCare – The Division of Healthcare Finance helps the disabled and seniors, among other demographics, with covering costs of premiums. Commission on Aging – This site contains a detailed and comprehensive list of frequently asked questions about Medicare. Residents of the Bluegrass State have access to Medicare Savings programs, free healthcare guidance and assistance with paying for prescription drugs. Read more to take advantage of these resources. Medicare and Medicaid Prescription Drug Info – This site provides guidance on how you can cover certain medical services and supplies with Medicare. Medicare Savings Program Information – Certain individuals with limited incomes are eligible for partial financial assistance with Medicare premiums, deductibles, or coinsurance. U.S. News Health – This report includes a detailed outline of what Kentucky Medicare Advantage plans can entail. Kentucky SHIP – This organization provides a free service to seniors who are looking for answers about Medicare coverage, costs and other questions. You can find Medicare Savings Programs and Medicare Advantage coverage in Louisiana. Find out more by visiting the sites below. Louisiana SHIP – SHIP provides plenty of guidance to make sure you understand your Medicare coverage and all of the options available to you. Help With Medicare Costs – See all of the ways the state of Louisiana can offer assistance with Medicare. Medicare Savings Program – Louisiana Medicaid may be able to help you pay for some of your Medicare costs if you qualify. Louisiana SenioRx – This is a program that helps qualified Louisianans find discounted medications. Medicare beneficiaries in Maine have a number of resources at their fingertips. The Pine Tree State offers options for those with low incomes to help pay for their Medicare benefits, as well as resources to help pay for prescription drug costs and to help those with disabilities. State of Maine Bureau of Insurance – The Bureau of Insurance provides a guide to Maine’s state resources for health insurance and Medicare questions. State of Maine Aging and Disability Services (SHIP) – Through SHIP, trained counselors offer free advice and guidance to Medicare beneficiaries in Maine. MaineCare – As Maine’s Medicaid program, MaineCare helps people living in the state get the help they need for out-of-pocket healthcare costs that Medicare doesn’t cover. Eligibility Guide – This is a resource for determining eligibility for MaineCare. Alpha One – Maine offers a number of resources for people living with disabilities. Learn more about Medicare benefits for those with disabilities. Maine Low Cost Drugs for the Elderly or Disabled – This is a state program to help people pay for prescription and over-the-counter drugs. Medicare Savings Programs (MSPs) – Learn more about Maine’s state-specific guidelines for Medicare Savings programs. If you live in Maryland, there are plenty of resources to help you learn about your Medicare coverage. You may qualify for Maryland Medicare Savings Programs. Visit these sites to learn more. Maryland SHIP – Maryland’s State Health Insurance Program can help you understand your Medicare benefits and rights. There are local offices that are ready to assist in all 24 counties. Medicare Savings Programs Application – Fill out this application to participate in the Qualified Medicare Beneficiary Program (QMB) or the Specified Low-Income Medicare Beneficiary Program (SLMB). If you qualify, the QMB program will pay your Medicare premiums, copayments and deductibles. The SLMB program pays your Part B premium only. Senior Prescription Drug Assistance Program (SPDAP) – Maryland’s SPDAP program offers assistance to qualifying seniors who need help paying for their prescriptions. You must be a Medicare recipient and have an income at or below 300% of the federal poverty level. The Bay State and home of the Boston Red Sox boasts more than just recent baseball greatness. Massachusetts also offers a variety of helpful resources for Medicare beneficiaries. SHINE (Serving the Health Insurance Needs of Everyone) – The SHINE program in Massachusetts offers free education and counseling to state citizens who have questions about Medicare. Massachusetts Division of Insurance – This site is a comprehensive resource for state insurance information. Massachusetts Executive Office of Elder Affairs – This is another great source of Medicare, Medicaid and other health insurance information for Massachusetts residents. MassHealth – Explore this site for more details about Massachusetts’ Medicaid Program. This site features helpful information, as well as trained counselors who can give free and unbiased guidance. Prescription Advantage – Find help for prescription drug costs with this state program. Michigan offers a number of resources to help Medicare recipients. Visit the websites below to find more helpful information. Michigan Medicare/Medicaid Assistance Program (MMAP) – MMAP offers a wealth of information for both Medicare and Medicaid recipients to better understand their health coverage options. Medicare Buy-In Program – Also known as the Medicare Savings program, the buy-in program can help you pay for certain out-of-pocket costs you’ll encounter as a Medicare beneficiary. MiRx – Michigan’s Prescription Drug Discount card is a free program that helps residents who do not have prescription drug coverage. Minnesota offers assistance and a number of helpful resources to the state’s Medicare recipients. Learn more about Medicare in Minnesota. Minnesota SHIP – The Minnesota Board on Aging’s volunteers serve seniors and provide answers about their Medicare coverage. Medicare Savings Programs – These programs can help Minnesotans pay for Medicare costs. Find out if you qualify. Low Cost Options for Prescription Drugs – This site provides a comprehensive list of programs in Minnesota that can help pay for the cost of medications. Medicare: The Details – This site offers up-to-date information on the Medicare program, including how the program works for people under age 65 who have disabilities. The Magnolia State has a lot to offer Medicare recipients. Check out the resources below to learn more about your options in Mississippi, including Medicare Savings Programs. Mississippi SHIP – The Mississippi SHIP has volunteers on call to answer all of your question about your Medicare and Medicaid coverage. Medicare Cost-Sharing Programs – This site gives a brief overview of some cost-sharing programs available to Mississippi Medicare beneficiaries. Contact your local SHIP office to learn more. Mississippi Department of Insurance – The state department of insurance can help you learn more about your health insurance options, including Medicare coverage in Mississippi. The Show Me State offers programs that can help Medicare beneficiaries with their out-of-pocket costs. Learn more about these and other Missouri resources by exploring the sites below. Missouri CLAIM – This organization provides free and unbiased information about Medicare to beneficiaries and potential enrollees in Missouri. Missouri Department of Insurance – The state department of insurance offers free information and trained counselors to help educate Medicare beneficiaries. Programs to Help You Pay – This site provides a comprehensive list of resources that can help pay for out-of-pocket Medicare costs and prescription drug coverage. The Missouri Rx (MoRx) Plan – Missouri offers the MoRx Pharmacy Assistance Program to help coordinate Medicare Part D prescription drug benefits. Medicare beneficiaries in the Treasure State have plenty of resources available to them. Read on to learn more about Medicare and to find out if you qualify for certain programs that will help you cover some of your Medicare out-of-pocket costs. Montana Guide to Medicare – This state website answers some of the questions you may have about your current or future Medicare enrollment. Big Sky Rx Program – If you are a Montana senior and you meet the income requirement, you may be eligible to receive assistance in paying for your prescription drug costs. SHIP – Montana SHIP’s mission is to advocate, educate and empower seniors and caregivers to help them make better and more informed decisions about Medicare. Medicare 101 – Here is more information about Medicare in Montana. Nebraska offers several valuable resources to help you learn more about Medicare coverage in the Cornhusker state. SHIIP – SHIIP counselors can help seniors in Nebraska understand their healthcare insurance options for free. S. News Health – Learn about some of the Medicare Advantage plans and Medicare Part D plans that may be available in your area of Nebraska. Nebraska Department on Aging and Elder Services – This organization provides assistance with senior benefit programs, including Medicare. A plethora of resources about Medicare are available to you if you’re a senior living in the Sagebrush state. Read on to learn more about how to take advantage of them. SHIP – SHIP counselors can discuss all of your health care options and help you find which one might work best for you, all at no charge to you. Centers for Medicare and Medicaid Services – This site provides seniors in Nevada with additional resources you might need in order to enroll in Medicare. They can also help answer questions about Nevada health care coverage and payment options. Division of Welfare and Supportive Services – This site details some of the benefits that can come with the Medicare Beneficiaries program in Nevada. Nevada Senior Rx Program – If you meet the eligibility requirements, you may be able to receive assistance in paying for your prescription drugs. Are you a Medicare beneficiary living in New Hampshire? There is a lot of information at your fingertips. Learn how you may be able get some help paying for your Medicare expenses in the Granite State. New Hampshire Insurance Department – This site provides information regarding Medicare and other health insurance topics. ServiceLink Aging and Disability Resource Center – ServiceLink is a division of the New Hampshire Department of Health and Human Services. It helps people understand Medicare and Medicaid, among other programs. Medicare Beneficiaries Savings Program – This program is designed for low-income seniors or individuals with disabilities and can help pay for some or all of the out-of-pocket costs that come with Medicare. Prescription Drug Assistance – Here are several resources that help can New Hampshire residents pay for the costs of their prescription medications. Here are some of the programs that can help you learn more about your Medicare coverage and make informed decisions if you live in New Jersey. There are a number of initiatives that could be of benefit to you. New Jersey SHIP – This program exists to help educate New Jersey Medicare beneficiaries about their health insurance coverage and answer questions they may have. Get Help Paying Your Medicare Costs – Find out if you qualify for a Medicare Savings Program or a Low-Income Subsidy for Part D prescription drug costs. Senior Gold Prescription Discount Program – This is a program that can help pay for the cost of necessary prescription drugs for seniors. Pharmaceutical Assistance to the Aged and Disabled – This site offers details about an additional prescription drug assistance program in New Jersey. Hearing Aid Assistance to the Aged and Disabled (HAAAD) – HAAAD can provide a $100 reimbursement to qualified individuals for the purchase of hearing aids. Are you a senior living in the Land of Enchantment? There are a number of Medicare resources available to you, such as Centennial Care, a New Mexico program that could help cover some of your out-of-pocket healthcare costs. NM HICAP – The Health Insurance Consumer Assistance Program can help answer any questions you may have about Medicare coverage. Law Help New Mexico – This website describes the different parts of Medicare and what you can expect with the enrollment process. Centennial Care – Learn more about how Medicaid services may be able to help cover some of your healthcare costs. NM Aging and Long-Term Services Department – If you want to find more information on New Mexico health care, home delivered meals, transportation or assisted living centers, this department can offer some support. The Empire State offers support for its residents in a number of ways, including drug assistance and Medicare Savings Programs. New York’s EPIC program is an additional resource that can help many eligible Medicare beneficiaries cover their out-of-pocket prescription drug costs. New York Health Insurance Information, Counseling and Assistance (HIICAP) – This site provides free counseling, information, advocacy and assistance for Medicare beneficiaries, including information on Medicare Part D Prescription Drug plans. Medicaid in the State of New York – This resource answers a long list of questions you might have about Medicaid eligibility, availability and cost coverage in New York state. Aged, Disabled and Blind (ABD) in New York City – This is a state-sponsored public health insurance program for people age 65 or older who are blind or disabled. Elderly Pharmaceutical Insurance Coverage (EPIC) Program – Administered by the Department of Health, EPIC helps more than 280,000 income-eligible seniors aged 65 and older to supplement their out-of-pocket Medicare Part D drug plan costs. Medicare Savings Programs (MSPs) – New York State has no limit on assets regarding Medicare Savings Programs. North Carolina offers Medicare Savings Programs and prescription drug assistance to its residents. Click on the links below to learn more. North Carolina Seniors’ Health Insurance Information Program (SHIIP) – SHIIP counselors can answer all of your questions about Medicare eligibility, enrollment, benefits and rights. Medication Assistance Program (MAP) – This program helps to give low-income individuals access to important prescription medications. Health Insurance Options for People on Medicare Due to Disability – This brochure explains how Medicare works for people with disabilities, including information about Medicare Advantage policies. The Roughrider State offers a number of healthcare benefits to its seniors. Adults and Aging Services provides various programs that help North Dakota seniors live a comfortable and non-restrictive life, and there are several programs that can help with your prescription drug payments. ND Insurance Department – This site provides information about the State Health Insurance Counseling Program, which offers neutral, unbiased advice about your health care options. Adults and Aging Services – The Department of Human Services offers programs that assist seniors and people with disabilities in North Dakota live safely and comfortably. Medicare FAQ – The ND Insurance Department provides a detailed FAQ list that will help you through the entire Medicare enrollment process. Prescription Connection – This program connects North Dakota citizens of all ages to discounted prescription drugs. The Buckeye State offers several programs, counseling and other services to Medicare recipients. The following links provide more information. Ohio Department of Aging – The Ohio Department of Aging provides a number of resources and information for older adults living in the state. Ohio Department of Insurance – This resource list includes all things Medicare in Ohio. Medicare Ohio Help – This organization put together a 60 page guide that can help teach you everything you need to know about the services and supplies that Medicare can provide to Ohio residents. Frequently Asked Questions By Ohio's Medicare Beneficiaries – You are not the only one that has a handful of questions about Medicare. The OH DOI put together a guide of the most commonly asked questions on this topic. Ohio Partnership for Long Term Care – This partnership program can help older adults in Ohio find resources for making long term care more affordable. Take a look at the resources below to learn more about Oklahoma Medicare coverage and other insurance information. The Sooner State has a number of resources designed to help older adults understand and explore their options. Low-Income Subsidy for Prescription Drugs – This program is available for Medicare recipients who have limited means and need help paying for prescription drugs. Medicare Assistance Program – This is a go-to resource for all things Medicare in Oklahoma. Oklahoma SHIP – The Oklahoma SHIP offers free and unbiased information and counseling to Oklahoma residents regarding topics such as Medicare coverage and Medicare Advantage plans. Oregon offers health insurance assistance options for those with disabilities and for people with limited financial resources. Learn more about some of the resources available to residents of the Beaver State. SHIBA volunteers by county (SHIP) – This resource helps you find insurance counseling resources in every county of the state. Search by county and reach out to your local office for free assistance. Oregon Health Plan (OHP) – This organization is committed to helping residents of Oregon maintain access to affordable health care, typically through a Coordinated Care Organization (CCO). Aging and Disability Resource Connection (ADRC) of Oregon – This site provides local information and services for seniors and for those with disabilities. Medicare Savings Program – Oregon has state-specific guidelines for Medicare Savings programs, including no limit on assets. Pennsylvania provides lots of information for its Medicare beneficiaries. From Extra Help to drug assistance programs, visit some of the sites below to further educate yourself on what’s available the Keystone State. Pennsylvania Department of Aging – This is a free program that offers counseling to seniors and disabled individuals who receive Medicare benefits. Medical Assistance for Older People and People with Disabilities – These are programs that can help cover the costs associated with Medicare for qualifying individuals. Special Pharmaceutical Benefits Program – This program can help pay for your Medicare Part D (prescription drug coverage) premium if you’re a qualified Pennsylvania resident. Learn more about your Medicare benefits as a senior living in the Ocean State. Rhode Island provides a plethora of information to help you learn more about your coverage options. Rhode Island Partnership for Long-Term Care – Medicare does not pay for the long-term care services that some seniors require, but with this state partnership program, you may qualify for at-home assistance. Division of Elderly Affairs – With this helpful resource, you can see if you qualify for Medicare benefits and for Medicare payment assistance programs. U.S. News Health – This report includes a detailed outline of what some Medicare Advantage plans may entail in the state of Rhode Island. Rhode Island Pharmaceutical Assistance – If you are over 65 years old or are age 55 and disabled, this program may be able to provide help in paying for your prescription drugs. The Palmetto State offers supplemental health insurance and prescription drug assistance to its residents. Click on the links below to learn more about South Carolina health insurance options and Medicare information. South Carolina Senior Citizens’ Handbook – This 71-page guide is an expansive resource for South Carolina seniors who want to know the ins and outs of laws and programs that affect them. South Carolina Medicaid Long Term Care Eligibility – In order to be eligible for this service, you must meet specific income criteria. SC SHIP – To assist in the complicated and sometimes confusing aspects of Medicare, this organization provides free and unbiased counseling to help you understand your healthcare options. Here are a few resources to help you explore your Medicare benefits in the Mount Rushmore State. Valuable South Dakota insurance information is at your fingertips, such as how you may be able to get some help covering your Medicare costs. Consumer Protection – The SD Attorney General put together this comprehensive site that gives valuable information about Medicare to seniors in South Dakota. Department of Social Services – If you are a senior and need help paying for your prescription drugs, you can consider enrolling in Medicare Part D to help offset some of the costs of your medications. Medicare Savings Program – This program assists individuals with payments on their Medicare expenses. Tennessee has several resources that could be helpful in your quest to learn more about your Medicare coverage. In Tennessee, there are Medicare Savings Programs that may help you save on Medicare costs. Check out some of the links below. Tennessee SHIP – Tennessee’s SHIP offices can provide free assistance and counseling about your Medicare coverage. Medicare Cost Sharing Programs – There are four primary Medicare Cost Sharing programs that you may be eligible for in Tennessee. TN Medicare Help – This site is dedicated to educating Tennesseans on Medicare benefits and Medicare fraud. Are you a Medicare recipient residing in Texas? Take a few minutes to educate yourself on some of the specifics of how Medicare works in the Lone Star State. Texas offers Medicare Savings Programs that follow federal income guidelines and asset limits. Here are some helpful links to use in your research. Insurance Resource for Medicare Beneficiaries – This is a compilation of helpful and state-specific information for Medicare recipients in Texas. Publications and Other Information for Seniors – This page offers a range of Medicare and long-term care information for Texas seniors. Your Texas Benefits – Learn more about Medicare Savings Programs in Texas and start your application for through the Your Texas Benefits site. If you are a senior living in the Beehive State, learn about what healthcare options are available to you and how you may be able to get assistance in covering some of the costs for your prescription drugs. New Medicare Rules – In 2008, the Department of Insurance updated their rules around Medicare. Medicare Advantage – This page provides a great variety of information about Medicare Advantage plans in Utah. Utah Health Insurance Consumer Help – The Centers for Medicare and Medicaid Services provide a list of agencies that can help answer questions you may have about health care coverage in Utah. Rx Connect Utah – This program links you to the prescriptions you need if you cannot afford them. Aging and Adult Services – Through the resources on this site, seniors can be connected to resources to help make their lives easier, such as transportation, meal deliveries and caregiver support. The Green Mountain State provides a number of helpful resources that Medicare recipients may find useful. Age Well Vermont — Vermont’s State Health Insurance Assistance Program (SHIP) offers several services for seniors, including a helpline, in-home visits, care transitions and more. VPharm — VPharm helps individuals enrolled in Medicare Part D pay for prescription medications. Eligible recipients pay a monthly premium for VPharm (the amount is dependent upon income and eligibility). Medicare Savings Programs (MSPs) — Vermont Law Help put together this helpful information about how to apply for Medicare Savings Programs in Vermont. Are you looking for more information on Medicare in the Old Dominion State? You have come to the right place. Virginia offers prescription drug assistance to qualifying residents and also offers a number of resources for seniors to learn more about their health insurance options. Medical Assistance for Medicare Beneficiaries – A Medicare savings program may allow you to help cover some out-of-pocket costs of your Medicare Part B coverage. Virginia Division for Aging – This page provides links to topics on various subjects such as abuse and neglect, caregivers and Alzheimer's. Virginia Insurance Counseling and Assistance Program (VICAP) – If you are confused on what healthcare plan will work best for you, consult with a VICAP counselor who will provide you with unbiased information to help inform your decision. Prescription Drug Assistance – There are many programs available to qualifying Virginia seniors who need help with paying for their prescription drugs. If you’re a Medicare beneficiary living in the Evergreen State, there is a lot of information that may be helpful to you regarding your health insurance options. Learn how you may be able to receive help paying for some of your Medicare expenses. Washington Law Help – This page provides legal assistance and information about Medicare and Medicaid services. Office of the Insurance Commissioner – Find out how Medicare works, when you should enroll and what it may cost and cover for you. Statewide Health Insurance Benefits Advisors – SHIBA offers advice from counselors who can help lead you in the right direction for your health care needs. Washington Prescription Drug Program – The goal of this site is to provide Washingtonians with information about more affordable options for prescription medicines. Explore the resources available to you that can help you understand your Medicare benefits and health insurance options in West Virginia. The Mountain State provides services such as prescription drug assistance and Medicare Savings programs. SHIP – This is a 25-year-old program that provides neutral and unbiased information on health care coverage to West Virginians. West Virginia Assistance Programs – There are a plethora of resources available in West Virginia that can assist state residents in paying for their needed medications. West Virginia Consumer Assistance Programs – West Virginia offers various consumer assistance programs that can help you with any questions you may have about Medicare. Medicare Savings Program – Read this helpful guide to see if you are dually eligible for both Medicare and Medicaid in West Virginia. Below are some resources to help Wisconsinites understand their Medicare benefits and rights. Learn more about Medicare Savings Programs and other resources that are available to qualified Wisconsin seniors. Wisconsin SHIP – SHIP offers free Medicare counseling for Wisconsin residents. Medicare Savings Program/Medicare Premium Assistance – You may be able to get help from the Wisconsin Medicaid program if you’re having trouble paying for your Medicare expenses. There are four programs with different eligibility requirements. Prescription Drug Assistance Programs – This page provides a list of resources that may be able to help you pay for your prescription drugs. Wisconsin State Services for Adults – The Department of Health and Human Services provides a variety of resources for seniors, their families and caregivers. The Cowboy State offers several Medicare Assistance programs and a State Health Insurance Program that offers counseling and other services to Wyoming Medicare recipients. The following resources provide more information. SHIP – Contact the State Health Information Program if you are trying to make a health care plan decision and need unbiased advice. U.S. News Health – Here is some information about Medicare Advantage plans and Medicare Prescription Drug plans that may be available in Wyoming. Wyoming Health Insurance Consumer Help – The organizations listed on this page can help you make the most of your Medicare options. *You must continue to pay your Medicare Part B premium. $0 premium plans may not be available in all areas.